Google Earth Blog: Apple iPod Ad in Google Earth? Apple iPod Ad in Google Earth? Got an E-mail over the weekend from a Rich Boakes to check out his blog entry about his discovery of a new ad campaign by Apple. Apparently, according to Rich, Apple has built a 1.4 km tall picture of an iPod viewable from space (as seen from Google Earth). You can see the iPod in Google Earth here. According to the blog the ad campaign starts next month. This is just amazing! We have already heard of people planning to go into the business of doing roof-top and crop advertising. But, it had been noted the business will be a hard sell, since many of the photos in GE are two to four years old. So, if you put up your ad now, it may (or may not) be seen for two to four years (or more). Since Apple first released the iPod in 2002, I guess its possible they built this ad back then. And, although Google Earth wasn't even a twinkle in Larry Page's eye in 2002, Apple does have an amazing marketing reputation. Although, one has to wonder about previous mis-interpretations of satellite photos like the supposed Flying Car in Australia, or the face on Mars. I just don't know, could this really be an iPod ad? It sure looks like one. Nice find Rick! We'll be waiting this Saturday to see if the ad campaign starts as promised. Do you not think that the date of Saturday's "launch" is significant (1st April)? Looks like a water treatment plant to me. 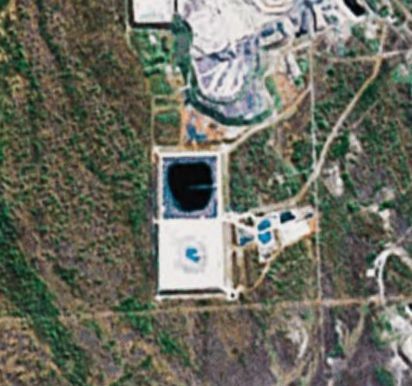 Yeah, it looks more like some form of tailings/runoff pond, one partially full, one mostly dry. I've surveyed square collection ponds that have looked just like this. Not to mention, if Apple really wanted to put up an iPod ad for satellites/planes to see, why wouldn't they do it on their own roofspace at 1 Infinite Loop, Cupertino, rather than in the middle-of-nowhere, Australia? It looks to me like a settling pond at a water treatment plant that just coincidentally in a cool artistic way looks like an iPod. Sorry to disappoint, but this isn't an ad for Apple iPod. What you are looking at is the tailing dam (water settling pond) for the Paddington Mine in Western Australia. They are two square shaped ponds, the northern one is full of water, the southern one appears to be dry.